When asked to write a biography of Edward Rutledge I was excited because my grandmother, Valeria North Burnet, had done a masterful piece of detective work in documenting our family’s genealogy. She accomplished this in the 1920s with no typewriter and before the age of computers. With the help of a telephone and a great deal of letter writing, and then documenting everything, she produced a remarkable book that traced her forbears and those of her husband. My grandfather was directly descended from Thomas Heyward, Jr., and bore his middle name, Henry Heyward Burnet. He was collaterally descended from Arthur Middleton and Edward Rutledge. Edward Rutledge was born in Charleston, South Carolina on November 23, 1749. He was the youngest son of Dr. John Rutledge, who emigrated from Ireland to South Carolina about the year 1735. A diligent Rutledge family historian on the internet has ascertained that Edward was the grandson of Thomas Rutledge who lived in Callan, County Kilkenny, Ireland, about 65 miles southwest of Dublin. Edward’s mother was Sarah Hert, a “lady of respectable family, and large fortune.” Sarah’s grandfather, Hugh Hext, came to South Carolina from Dorsetshire, England about 1686. Sarah’s father, also named Hugh, left to his “dearly beloved and only daughter” substantial lands inherited from the Fenwick family, two homes in Charleston, a 550 acre plantation at Stono, and 640 acres on St. Helen’s in Granville County. Not a lot is known about the early years of Edward Rutledge, but we do know that he was placed under the tutelage of David Smith who instructed him in the learned languages. He was not a brilliant student, but his skill as an orator later in his life perhaps is due in part to this early experience. After this education Edward read law with his elder brother John, who was already a distinguished member of the Charleston bar. When he was twenty years of age, Edward Rutledge sailed for England and became a student of law at the Temple. He had the experience there of listening to some of the most distinguished orators of the day, in court and in parliament, a precursor to his later ability. The Temple in London was an ancient institution for teaching law founded by the Knights Templar in the reign of Henry II in 1185. The Inner Temple, where Edward studied, became an Inn of Law in the reign of Edward III about 1340. The Temple was a prominent source for teaching law to many famous South Carolinians including Edward’s uncle Andrew Rutledge, Edward’s brothers John and Hugh, Arthur Middleton, Thomas Lynch, Jr., Thomas Heyward, Jr. and several members of the Pinckney family. Rutledge returned to Charleston in 1773 to practice law. He quickly gained recognition as a patriot when he successfully defended a printer, Thomas Powell, who had been imprisoned by the Crown for printing an article critical of the Loyalist upper house of the colonial legislature. Despite his youth (he was only 24 at the time) he earned a reputation for his quickness of apprehension, fluency of speech and graceful delivery. Soon after he established his law practice Edward married Henrietta Middleton, the sister of Arthur Middleton who would also sign the Declaration of Independence. The couple had a son and a daughter, and a third child who died as an infant. After the death of his first wife in 1792, Rutledge married Mary Shubrick Eveleigh, a young widow. This marriage continued the inter-relationship among the signers of the Declaration, since two of Mary Shubrick’s sisters had married signers of the Declaration—one married Thomas Heyward, Jr. and one married Thomas Lynch, Jr.
Henrietta’s great-grandfather was Edward Middleton, who was born in 1620 and came to the Barbados in 1635 on the Dorsetand settled in South Carolina in 1678. He was Lord Proprietor’s deputy, assistant justice, and a member of the Grand Council from 1678 to 1684. Henrietta’s grandfather, the Honorable Ralph Izard, was born in England and came to South Carolina in 1682. Rutledge enjoyed a happy home life and public success in the succeeding years. He was first elected to the Continental Congress and the South Carolina House of Representatives. In both bodies his increasing self-confidence and maturation of judgment brought him the esteem of the delegates. When a trial vote on independence was taken on July 1, the South Carolina delegates voted “no”. Rutledge then asked for a one day postponement of the vote and met with his South Carolina colleagues that night. He persuaded them to support Lee’s motion, and next day South Carolina reversed its course, making the official vote for independence unanimous, 12 to 0, with New York abstaining. Rutledge signed the Declaration in August, at age 26 the youngest signer of the Declaration of Independence. 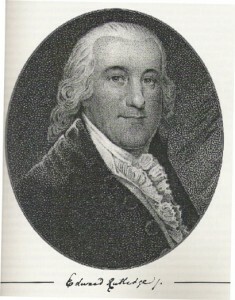 In the stage play and then movie “1776”, the character of Edward Rutledge is portrayed as the leader in the opposition to the slavery reference in Jefferson’s draft of the Declaration. There seems to be no corroboration of this in the written record, although Rutledge proved to be a passionate defender of South Carolina’s state rights throughout his tenure in the Continental Congress. Later in his career, during his tenure in the South Carolina House of Representatives, he opposed the opening of the African slave trade. This provides a remarkable insight into his sense of belief in the dignity of all human beings, as his fortune had been built on the backs of slaves working on his rice plantations. In June 1776, before the vote for independence, Rutledge was chosen to represent South Carolina on a committee to draft the country’s first constitution, the Articles of Confederation. Again, Rutledge shared his reservations about the Articles with John Jay. “I greatly curtailed it never can pass…If the Plan now proposed should be adopted nothing less than Ruin to some Colonies will be the Consequence of it. The Idea of destroying all Provincial Distinctions… …is…to say that these Colonies must be subject to the Government of the Eastern Provinces…I am resolved to vest the Congress with no more Power than what is absolutely necessary.” The Confederation was heatedly debated by the Congress for many months with regard to representation, state boundaries, taxation and the powers of the new central government. The Articles were not completed and signed until November 15, 1777, and were not ratified by the last state until 1781. In September 1776 Edward Rutledge, John Adams and Benjamin Franklin were selected by Congress to attend a meeting at the Billopp House on Staten Island, requested by Lord Admiral Richard Howe. The meeting was pleasant but nothing was accomplished. Rutledge continued to serve in the Congress, but illness prevented Rutledge from taking his seat in Congress in 1779, and he returned home. He was appointed a lieutenant colonel in the Charleston Battalion of Artillery, and served under General William Moultrie in the victory over the British forces under Major Gardiner, driving them from Port Royal Island. A year later he was taken prisoner during the British siege of Charleston on May 12, 1780, along with Thomas Heyward and Arthur Middleton. Rutledge was held in a prison off the coast of St. Augustine for eleven months, and was exchanged in July, 1781. He began a long 800 mile journey to return home. Edward Rutledge held a variety of distinguished public offices until 1798. He served in the South Carolina legislature from 1782 to 1798, and voted in favor of ratification of the U.S. Constitution in the South Carolina Constitutional Convention in 1790-1791. During his time in the legislature drew up the act which abolished primogeniture, worked to give equitable distribution of the real estate of intestates, as well as voting against opening the African slave trade, as mentioned earlier. During this period the wealth of the Rutledge family increased substantially–his law practice flourished, and in partnership with his brother-in-law, Charles C. Pinckney, he invested in plantations. Rutledge declined President George Washington’s offer of a seat on the U.S. Supreme Court in 1794, but ran for office and was elected Governor of South Carolina in December, 1798. The accomplishments of Edward’s older brother, John Rutledge, rivaled those of Edward’s. John was an early delegate to the Continental Congress, President of South Carolina from 1776 to 1778, Governor of South Carolina in 1779, a member of the Constitutional Convention in 1787, a signer of the U.S. Constitution, a Justice of the U.S. Supreme Court from 1789 to 1791 and was appointed Chief Justice of the U.S. Supreme Court by President George Washington in 1795, despite his opposition to the Jay treaty with Great Britain. Patrick Henry, by comparison, viewed Rutledge as the greatest orator among a group that included John and Samuel Adams, John Jay and Thomas Jefferson. It was said that the eloquence of Patrick Henry was as a mountain torrent, while that of Edward Rutledge was like a smooth stream gliding along the plain—that the former hurried you forward with a resistless impetuosity, while the latter conducted you with fascinations, that made every progressive step appear enchanting. Edward Rutledge died in Charleston on January 23, 1800 while he was still Governor and was buried in St. Philip’s Churchyard Cemetery in Charleston, South Carolina. His loss was mourned by the people of Charleston and South Carolina, and impressive military and funeral honors were paid to him on the occasion of his death. In 1969 an historical marker was installed at the entrance to St. Philip’s Churchyard by the South Carolina Daughters of the Revolution, honoring both Edward Rutledge and Charles Pinckney. In 1974 the National Park Service designated St. Philip’s Church a national historical landmark. The stately home of Edward Rutledge still stands in the historic district of Charleston. After the Civil War the house was acquired by Captain Wagener, a wealthy merchant, who helped renovate the mansion during Reconstruction. 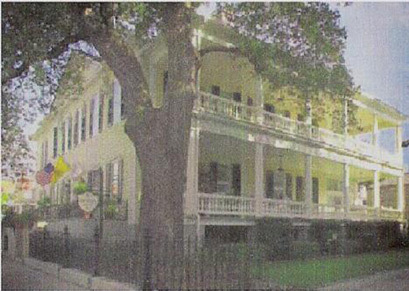 During the 1930s the house fell into some disrepair and was purchased by the Catholic Diocese of Charleston. For many years until recently the house was operated as the Governor’s House Inn with a fashionable look and elegant furnishings. The house is listed on the National Register of Historic Places and in 1971 it was declared a National Historic Landmark by the U.S. Department of the Interior. In Washington, D.C., near the Washington monument, there is a memorial park celebrating the signers of the Declaration, and one of the 56 granite blocks there is engraved with the name of Edward Rutledge. In the Rotunda at the National Archives nearby, Rutledge appears in the mural painting by Barry Faulkner, in the second row, second from the left. In the famous painting by John Trumbull, “The Declaration of Independence” in the Rotunda of the U.S. Capitol, Rutledge is shown on the right in a group of three standing delegates, the figure standing on the extreme right. Barthelmas, Della Gray, “The Signers of the Declaration of Independence,” 1997. This entry was posted in Signers by state, South Carolina. Bookmark the permalink. Hello, my husband’s family descends from Edward Rutledge! This was very exciting for my daughter to learn about. Sarah, I would encourage you to get your husband and daughter enrolled in the Society. If your daughter is pre-college, there is an interesting scholarship opportunity you might want to consider. Membership forms are available on this site. My mother was able to trace all the way back to 1845 to a richard king Rutledge and and from there richard baxter rutledge, fostine roy rutledge senior, fostine rutledge jr who sied in korean war snd then to my grand dad james rutledge. Is there a relation to edward rutledge? Kristen, we have no record of any of these names in the genealogy of Edward Rutledge, the Signer. We do not track relatives of the Signers. I’ve always heard that we are related to John and Edward Rutledge. My family history has been traced back to the Rutledge plantation near La Grange, Georgia,( Joseph Rutledge). My youngest daughter is starting to learn about researching family trees so this will be interesting to find out. Sheila, you have not given me enough data to confirm you are a Rutledge descendant. Can you start with yourself and work backward a few generations (using maiden names where appropriate.) I can tell you that a quick scan of our genealogical records did not show any members of the family in La Grange, GA. Having said that, I notice that we are missing lots of location information on this family. My Paternal grandmother was Gertrude Leticia Anderson. (2/10/1884-4/16/1967) Her Mother was luanna Rutledge (2/10/1866-7/26/1937). Her father was Thomas Rutledge in 1865, married to Martha Leticia Stephenson who was born near Nelsonville Ohio 4/23/1842 and died 10/20/1919. According to my Grandma, thomas was a descendant of “the signer of the declaration of Independence”..
Could you please assist me? Maureen, I cannot make your data fit with anything we know about the Edward Rutledge family. None of the names you provide are in our genealogy records. There is only one Thomas Pickney Rutledge in the list of Rutledge descendants and he was born in 1879, d. 1954, m. Ethel Gary Parrott. Note that this person was also a descendant of Arthur Middleton. I also can find no reference to Ohio as a location for members of the Rutledge family. I did find a family tree for Thomas Wilson Rutledge at http://www.rootsweb.com with your information. This Thomas was b. 17 Jan 1839 in OH, and his father, Thomas Armstrong Rutledge was b. 25 May 1802 in Londonderry, Ireland. Family stories such as this are not that rare. But the genealogical facts do not support the story. Jim, thank you so much for this information. 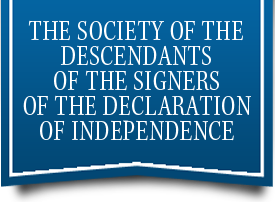 We are descendants of Edward Rutledge’s uncle, George Rutledge Sr. Would we be eligible to join the Society of Descendants of the signers of the Declaration of Independence? Here is my ancestry going back to Edward Rutledge & Elizabeth Graem, parents of our 7th great-grandfather, George & John (signer of US Constitution) & Edward’s (signer of Declaration of Independence) father, John. You must be a descendant of a Signer, and in your case, you are not. So you will not be eligible for membership. Jayne, that is correct. 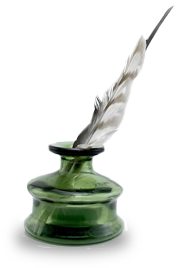 The membership requirement is that applicant is a DIRECT DESCENDANT of the Signer.